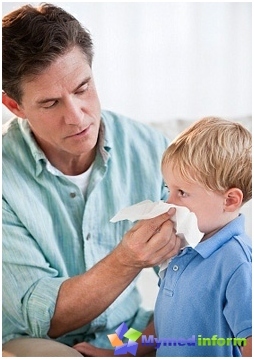 Many parents face the challenge ofstuffy nose and red eyes of their children during the spring and autumn period. It accompanies them all the warm season, when all the flowers and smells. This phenomenon is nothing else, as a pollen allergy or hay fever. The original cause of allergies in children can be hereditary. 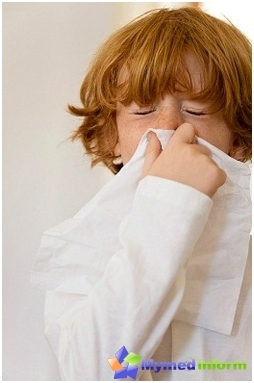 Many parents face the challenge ofstuffy nose and red eyes of their children during the spring and autumn period. It accompanies them all the warm season, when all the flowers and smells. This phenomenon is nothing else, as a pollen allergy or hay fever. So where does an allergy to pollen? During flowering plants produce pollen,which is carried through the air and enters the respiratory tract mucous membranes and humans. Those who are prone to allergies, responsive to its occurrence. They immediately begin to run tears, appears coldSometimes itching and coughing. This kind of disease physicians called "hay fever" or "hay fever." The original cause of allergies in childrenIt may be congenital heredity, if parents or relatives before her ill. Also it begins to affect the development and artificial feeding in the first year of baby's life, or the wrong lure. They entail the development of food allergies, which can back up and all sorts of harmful products to the chemical composition. But as early as three or four years for the first time reveals himself and hay fever. The most active it is observed at the age of 6 years. Hay fever danger that it may subsequently be formed instead of pollen asthmaWhich accompany the wheezing, dry cough andasthma attacks. Therefore, an important task for parents is the timely detection of the disease and the campaign to the doctor. Only he will be able to distinguish between allergic conjunctivitis (eye inflammation) and rhinitis (runny nose) from common cold symptoms. 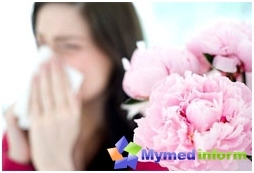 When the diagnosis is usually treatedbegin to identify the specific allergen and prescribe antihistamines. The most common method of identifying the allergen are skin tests, in which cause a small amount of a stimulus to the forearm of the child. After 20 minutes, the doctor evaluates the body's reaction as positive or negative. Such a test is made for children from three years. Yet another option analysis - blood sample from a vein. It can determine the pollen allergy to grass and trees. The peculiarity of these checks is that they are held only in November and lasts until March, that is, at a time when all the plants are not in bloom. Otherwise, you can provoke an aggravation of the disease. An important role in the upbringing of children sufferingpollen allergies, playing how parents perceive the disease and the measures taken to eliminate it. This is not to be sniffed at, thinking that the end of flowering the child will be healthy again. So, we can give some advice to the readers of our site who are faced with such a problem. If you notice that your childhave the above symptoms, in any case, do not start self-treatment. It is better to consult a pediatrician or allergist for a more qualified assistance. When you set the exact diagnosis, try not to withdraw a child outside in windy conditions, when the air is dry and easy to carry pollen. It is best to take a walk in the evening or after rain. Back street it is desirable to wash the baby's nose and throat, making a simple rinse. Also street clothes can be changed to a clean home. The apartment is not recommended to includeair conditioner, because it provokes the movement of air, it is better to use a humidifier. And of course, the house needed every day to carry out wet cleaning of floors and carpet cleaning, so they do not accumulate a more allergens. It will not hurt to pay attention to dietbaby food. If hay fever is so that, depending on on how your baby reacts to pollen, can still develop food allergies to foods akin. For example, when developing an allergy to pollen from trees, the apples, peaches, cherries and cherry can cause food allergy. If the agent is weeds, it is not advisable to eat eggplant, citrus, spinach, cantaloupe and watermelon. And in the case of a negative reaction to grasses, oats and wheat are contraindicated cereal, ice cream, pancakes and sorrel. For more information about which products are still associated with an allergy to pollen, you can see a doctor, he will tell you all the details and make a list of what can not be right for your child. As a precaution, the disease can begin to apply the medication before the flowering period, or just go for this period in a different climate zone. It is also a very effective method of treatment is consideredallergen immunotherapy, which holds the attending physician. Its peculiarity is that by entering into the body gradually increasing doses of allergens, pathogens, there is a gradual training of the body, which contributes to his "addiction" to the effects of Ardent. It gives good results in 80-90% of cases, there is a strong reduction of allergic reactions. And sometimes its action is prolonged for a couple of years. This procedure can be done from the age of five. But it also has contraindications, therefore, only an allergist may allow its implementation. The unequivocal answer, whether it is possible to cure hay fevercompletely, no. But in most cases, doctors say that it can only be reduced, but it is impossible to get rid of him. This genetic predisposition of man, and does not pass with time, as well as pollen and no longer appear. You just need to comply with preventive measures and in time to prevent the development of severe disease.